VCT is a common choice of flooring in commercial buildings, most commonly found in restrooms, kitchens, exam rooms and hallways. Regular maintenance is required for these floors to keep up their appearance and prevent permanent damage. 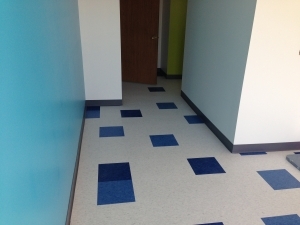 Here are five things you should know about VCT if you have it in your facility or are considering it as a flooring application. Our crew stripped and waxed this VCT floor in a medical office, applying four coats of wax as the client desired an extreme high shine on the floors. The factory finish is not enough! VCT is manufactured with a very thin factory finish coat of wax meant to protect it against minor abraisions during shipping and installation. This factory finish is not enough to endure daily wear and tear post-installation. Once new VCT is installed, it must be properly stripped and waxed with at least two coats of wax applied. For the best results, have the VCT stripped and waxed prior to moving furniture or people into the space, ideally allowing a full 24 hours of cure time before it is walked on. The post-wax wait time is the same for existing VCT as well. The VCT floors in these two pictures had just been installed and only had the factory finish of wax on them, you can see there is next to no shine on them. Traffic patterns dictate frequency of care. The rate at which the wax on VCT wears away directly correlates with the traffic the floor experiences, including both type and volume. One hundred people walking back and forth with greasy work boots or high heel shoes will require more frequent stripping and waxing than if only five nurses in Crocs tread on a VCT floor each day. 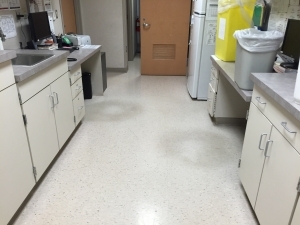 Assuming the floors are being mopped properly daily, the most tell-tale sign they are in need of service is the lack of shine compared to low-traffic areas (along the edges of the floor, for example). It is not uncommon for VCT to require stripping and waxing twice a year if not more in an average traffic environment. Damage can be irreversible- protect your VCT! Stripping and waxing can remove stains, build shine, correct previous poor strip jobs and improve the general look but it can never guarantee 100% return to the original appearance. 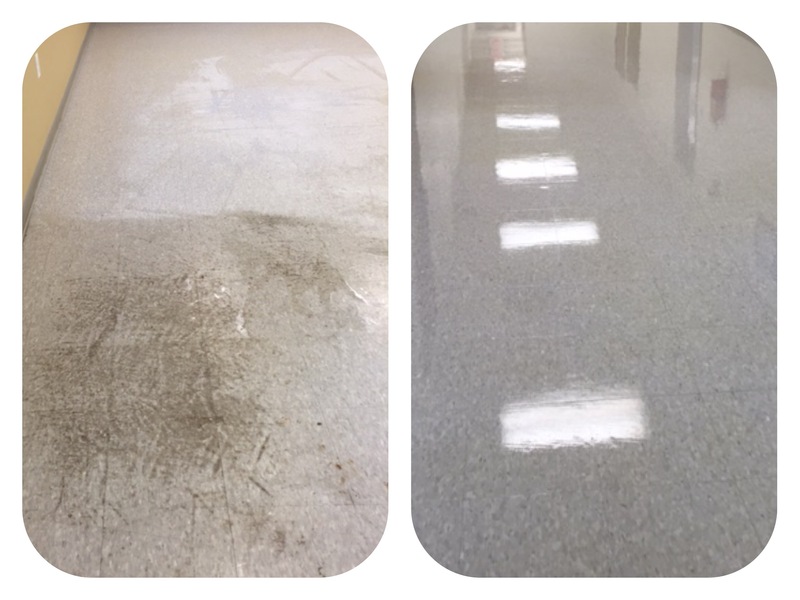 VCT is a porous material and dirt and grime may become permanently embedded in the exposed tile if all of the wax is allowed to wear away. You should never let 100% of the floor’s wax wear away before cleaning and re-sealing. 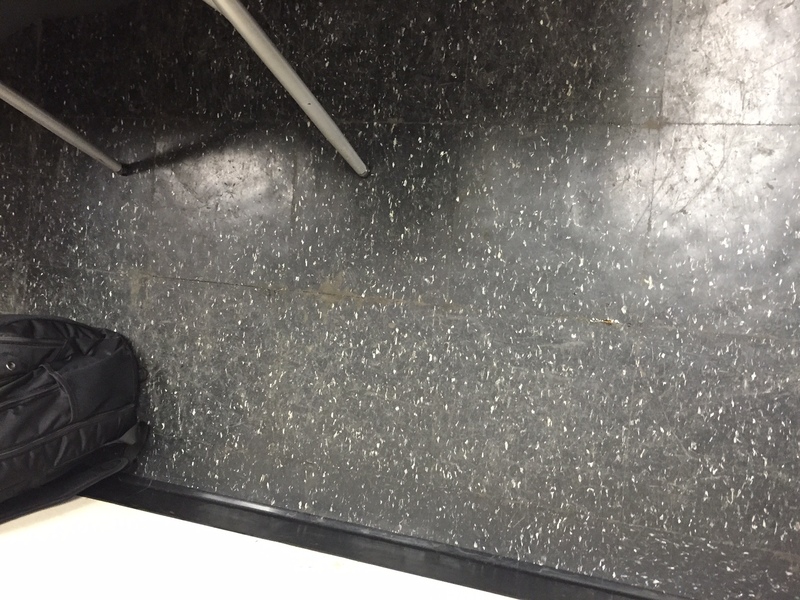 These two photos show permanent damage that has been done to the tiles of this floor due to a lack of wax. The edges of the individual tiles have started chipping away due to chairs sliding over the unprotected floor repeatedly. Computer chair mats, protective pads and throw rugs all cut down on the abuse a floor takes which protects not only the shiny appearance but the longevity of the tile itself. 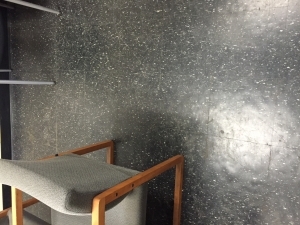 For example: A chair who’s wheels roll directly over the same area every day can quickly do permanent damage to the floor itself to the point that wax will not stick to sublayers of the tile. This creates an uneven shine to the floor when waxed and what little sealant is on that area will flake away quickly. The only way to correct this kind of damage is to replace the affected tiles or the entire floor. Less than six months after stripping and waxing, the damage rolling chairs without protective chair mats have done to this VCT is quite evident. VCT maintenance can go wrong easily! Maintenance for VCT flooring is very labor intensive, time consuming and requires expertise for it to turn out right. 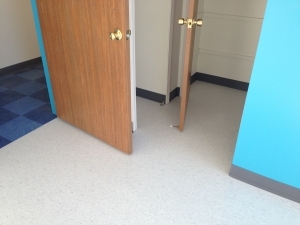 A test on the floor should be performed by your contractor prior to the floor care to provide a better understanding of how it will react to stripping. This can potentially prevent issues during the full service and result in a better end product. 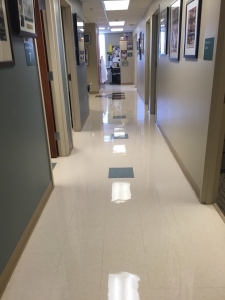 Telling your contractor what types of sealants have been laid in the past also provides them with valuable information to ensure you are happy with your freshly waxed VCT floors. To find a good contractor, ask around for referrals, view their work before signing a service agreement and be wary of any abnormally low quotes- as with most things, you get what you pay for! 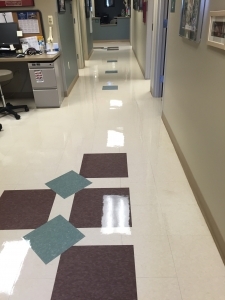 These ‘before and after’ photos demonstrate a superior strip job performed by our Operations Manager, Don Hankins, and his team. Restoration of original appearance cannot be guaranteed but an experienced contractor makes a huge difference in the outcome of your floors. Drying time for wax varies. There are many factors that determine how quickly freshly laid wax will dry. Room temperature, humidity, type of wax, thickness of the layer of wax laid and air circulation all affect whether the floor will be dry to the touch in one hour or ten. 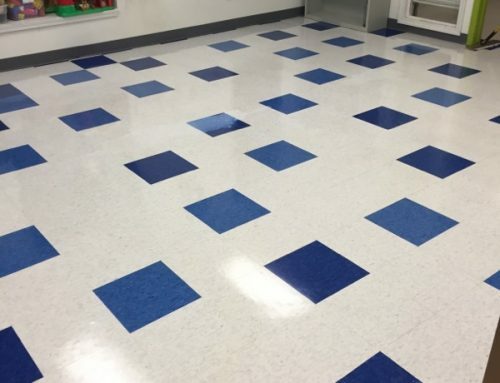 In most climate-controlled environments, each layer of wax should take about one hour to dry, but the entire floor may not dry at an even rate. 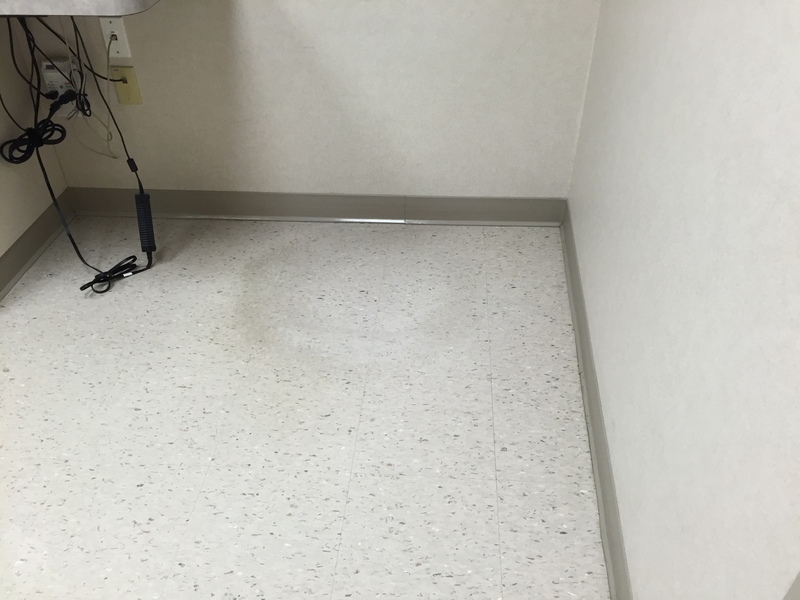 This is why a 24 hour cure time is ideal before the floor is walked on or furniture is placed back on it. Furniture and equipment should never be dragged across VCT; it can scratch not only the wax but permanently mar the tile itself. What questions about VCT and its care or other commercial cleaning problems do you have? Let us know and we will be happy to provide you with an answer! Visit our website at www.tedescoservices.com for information about the floor care solutions we can offer your business today!